Another quarter has come and gone, so it’s time for an update on the Lending Club returns I’ve been getting on my account. At the end of the third quarter, my account was sitting at a return rate of 14.69%. It’s actually improved a bit since then, but Lending Club has also added the ability to adjust the displayed NAR, which does some funny stuff (see below) and reduces the rate a bit. I think that’s a good thing (again, see below) and that’s the rate I’ll likely be using for future updates. A few months back, Lending Club introduced what they’re calling an adjusted NAR. Basically, it uses the historical charge off rates of loans at the different stages of delinquency. Obviously, the current loans have a historical rate of charge off of 0%. Once they go into the Grace Period, about 23%, 16-30 days late, about 49%, 31-120 days late, about 72%, and in full default, about 86%. As an example, my portfolio currently has two notes that are in the 31-120 days late category. So, when Lending Club is adjusting my NAR, they use the 72% figure and assume that 72% of the principle will be lost. Using that number, they then calculate the new, adjusted NAR. With the two notes late, my adjusted NAR is currently showing as 13.16%. Still a very healthy number, and likely a more realistic number. I like the new adjustment, as it should give investors a more realistic number to look at. As I mentioned above, my portfolio currently has two notes that are 31-120 days delinquent. And, if you go by the historical numbers, those two notes have about a 72% chance of eventually going into collections. I’ve been lucky enough to only have had one note actually go that far to date, and the collection agency was able to get a bit of that money back for me. It wasn’t the entire amount owed, but a significant portion of the principle, which I was happy for. I could try and sell off the two delinquent notes, but at this point, I wouldn’t get much out of them, so I think I’ll just ride them out and see what happens. The total principle involved is only about $35, so it would mean about a month and a half of lost interest payments. That’s a risk I’m willing to take. With the rates I’m getting, I don’t foresee stopping my investing through Lending Club. I may even start putting some more money into the account sometime in the future. At the moment, I’m content to just leave it and reinvest the payments each month. I’ve seen a few other investors that have either significantly changed how they’re using Lending Club, or have begun backing out of it altogether. I think it’s something that you need to be able to change how you do it, but I also believe that backing out altogether is a mistake at this point. The technology is still relatively new, and many of the changes that we’re seeing Lending Club make have been for the better. I’ve created a page that consolidates all of the posts I’ve done on Lending Club, as well as the quarterly updates since I began doing them. If you’re interested in starting to invest in Lending Club, you can read more on my Lending Club page, or you can sign up for an account and give it a go. Lending Club is a peer-to-peer lending service. People (like you and me) sign up for their site, and list a loan to be funded by investors (like you and me). I like to think of it as replacing the bank in a loan with me. (Except I’m not “too big to fail”.) Of course, with that comes the same risks that the bank assumes when it issues a loan. There’s a risk of late payments, missed payments, and default and it’s associated collection activities. Luckily, Lending Club and Prosper (another p2p lending site) take care of most of the paperwork for the lenders (and borrowers). 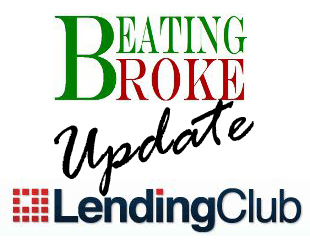 This post is the second quarter update on my Lending Club account, and the return I’m getting on my money. I’ve been mentioning in the last several updates how lucky I’ve been that I haven’t had a loan go into default yet. Well, that streak ended recently. I knew it was only a matter of time before one of the notes defaulted, and one has. Luckily, the loan that defaulted was a small one, and my portfolio has grown enough that the value of the default didn’t really affect the account too much. The value of the defaulted loan is about 1% of my Lending Club portfolio. There’s also a loan that is in the 31-120 days late category, that has the possibility of going to default, but at this point, the borrower is making attempts to pay the loan. The reason it’s still in the late category at all is because the most recent payment was only a partial payment. This loan is a larger loan than the defaulted one, so I may have to consider taking the loss on it and selling it at a discount to get it off my books. One of the things that I like most about Lending Club, and p2p lending as a whole, is that you get a relatively high churn on your money. It’s not a buy-and-hold scenario, per se. Yes, you invest in a note with the expectation of holding that note until it is fully paid off, but, as the payments come in monthly, that money is available for reinvestment. In my 1Q13 update, I mentioned that I’d been a bit lazy in my reinvestment of those funds. I was slightly better with that in the second quarter, and was able to keep most of the money pretty actively invested. Many people (myself included) call p2p investing a form of passive income. While not strictly meeting the criteria in that it does still require some activity on the investors part, it’s pretty close. Maybe we need to start defining passive income in terms of it’s passivity? Something like levels. Each level is achieved by it’s decile of passivity. For instance, I think p2p investing could be somewhere around 90-95% passive. That would make it a Level 9 Passive Income source. With about 15 minutes of work a month, I’ve earned almost $60 in interest payments as of the end of June of 2013. Last year, with the same amount of work, I earned $75.37 in interest payments. If I had significantly more money, that amount would be larger, but I think that the time spent each month to earn it would be a bit larger as well. Still, a pretty close to passive means of making some money. We’ve talked about most of the rest of the account, but the title did say that it was a return update, right? Yes. In my 1Q13 update, I mentioned that the rate of return then was being shown as 14.63%. As of 8/3/13, it’s being displayed as 14.08%. The combination of the defaulted loan, and the payoff of a couple of higher interest paying notes is bringing the rate down. I’ve been happy with the return I’ve been getting, but I truly think that a more reasonable expectation of return is somewhere in the 10-13% range. I’ll take the 14%+ returns I’ve been getting though. Click here to learn more about how I select my Lending Club investments. Overall, I’ve been really happy with my results at Lending Club. And, with the p2p lending industry as a whole issuing over 200 Million in loans in July, it would appear that there are plenty of other happy users too. Have you gotten your feet wet in p2p lending? Why or why not?